Villas Del Mar Condominiums- C103, Villa Paradise is a spectacular beachfront home in Puerto Aventuras offering privacy and exclusivity. 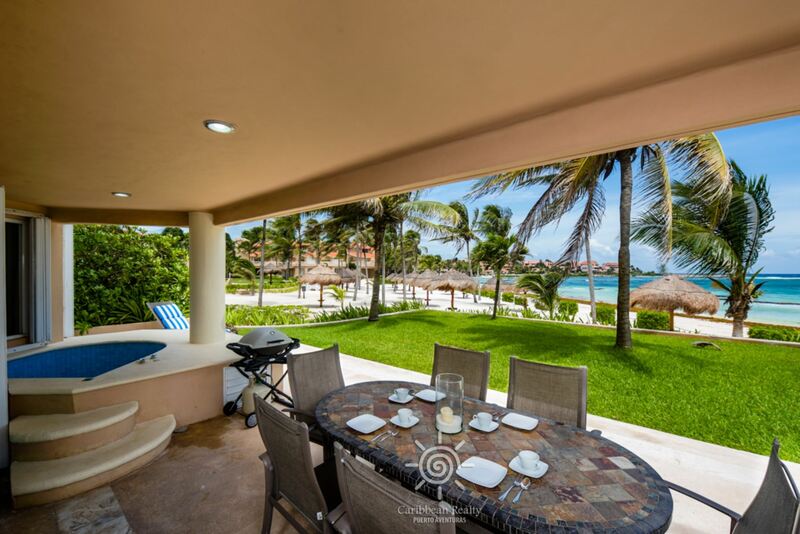 The villa is located in the sought after C building of the Villas Del Mar complex, occupying the premiere area of the beautiful palm fringed Puerto Aventuras beach. Enjoy the stunning panoramic ocean views from to the north to the south end of the beach, from this sumptuous 3 bedroom villa home. The villa boasts 2 spacious, master beachfront suites with king-size beds, private baths and glass patio sliders leading to the enormous terrace and jacuzzi. The garden side guest suite has a 2 queen beds as well as a private bath. There is an additional half bath within the fully equipped laundry room. Enjoy blissful days soaking in the jacuzzi while taking in the Caribbean atmosphere or perhaps relax to the sound of the gently lapping waves during an oceanside massage. Take a peaceful stroll on the beach and feel the powdery, soft white sand on your bare feet as you walk towards the soothing aquamarine ocean. Grab your snorkel and discover the magnificent wonders of Puerto Aventuras, and if you're lucky you may find a sea turtle or two, fish of all sizes and colors and so much more! The owners of the villa have lovingly decorated their home, with every detail thoughtfully decided, to make you experience the perfect vacation. The expansive living room has comfortable sofas to sink into, the dining area seats 6 and the well equipped gourmet kitchen will delight the keenest of chefs! Cook up your favorite meals or alternatively we can arrange a chef upon request who can cook local delicacies or a more international cuisine. Dine indoors or outdoors in style, the choice is yours! Surf the web with the wireless internet service... email family and friends and let them know what a fabulous time you are having! The Villas Del Mar facilities are unparalleled, boasting a huge swimming pool with shallow end for small children, sun loungers, outdoor dining tables and beach front palapas for shade. Manicured gardens are flanked by beautiful palms. Villas Del Mar is just steps away from the center of Puerto Aventuras, which is located around a marina where you'll find Dolphin Discovery, international restaurants, grocery stores, boutiques and post office. A golf course and tennis facilities are also located close-by within Puerto Aventuras. Puerto Aventuras is conveniently located to take advantage of the many places to visit in the area, including Mayan Ruins, Cenotes, stunning beaches, Eco parks Xcaret, Xelha and dive the beautiful Caribbean or cenotes. You will fall in love with Villa Paradise and never want to leave. 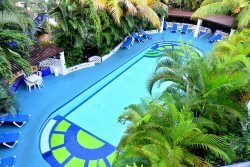 For your dream vacation, choose Villa Paradise! Check in - Check out Time: Check in is after 3:00 P.M. and check out is before 11:00 A.M. Arrangements can be made for secure storage of luggage should you require it in the case of an early arrival or late flight out.